Lots of people call the office once they book their permanent makeup course with us and ask about the potential earnings that they can make as a permanent makeup technician. So I thought that I would put together a potential earnings table for you to have a look at. Now lets be honest. Just like anything you set you mind to in life, it really is up to you in regards to what you want to earn as a permanent makeup artist. However, i think that it is useful to have rough guide to what you can expect to earn once you have mastered the skill of permanent makeup. 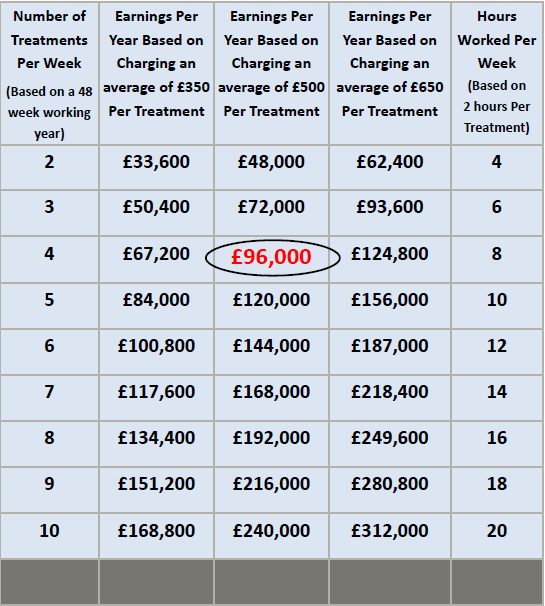 So you can see from the above table, to earn £96,000 as a permanent makeup technician you need to complete on average 4 clients a week with an average price of £500 per treatment, which would lead to a 8 hour working week. When you are just starting out as a permanent makeup technician, you are more likely to be commanding average prices around £350 per treatment in your first year, so realistically once qualified, you would need to be doing 5 – 6 treatments a week to earn this sort of money. However, even with just doing 2 or 3 clients a week you can be earning between £30,000 & £50,000 a year. Not bad for a 4 – 6 hour working week though!!! When you first qualify as a permanent makeup artist, the earnings you make per hour when you actually complete treatments will be very high. However, this means that your main job in your first year will be finding clients who want treatments. The good news is that we have been there and done that & have all the tools and resources available to be able to show you how get pretty much as many clients as you want. In fact we are the only company in the world that we know of, who run 3 day business & marketing courses exclusively for permanent makeup technicians. FACT: A beauty therapist earning £10 per hour would have to complete a 200 hour working week, every week for 48 weeks a year to earn the same money!!!!! If you book ‘The Complete Permanent Makeup Start-up Training Course‘ today, you will be guaranteed exclusive 1 on 1 training with 2013 Woman of the Year (in the Hair & Beauty Industry) & founder of The Permanent Makeup Training Academy, Katy Jobbins, for full the duration of your course. or anything else regarding our permanent makeup training courses, please call us at The Permanent Makeup Training Academy on 01444 300157. PreviousPrevious post:Why Do Students Choose To Train With Katy JobbinsNextNext post:Free 30 minute – 1 hour advice phone call, to help you ensure you pick the best training company for you.